Although orchids rarely come up in discussions about user-friendly plants, maybe they should. Those unfamiliar with orchids often imagine them as pampered, prima-donna houseplants instead of tough-as-nails perennials. The reality is that some orchids, such as showy lady's slippers (Cypripedium reginae), shrug off the sub-zero winters in U.S. Department of Agriculture plant hardiness zones 2 through 7. Others, such as delicate moth orchids (Phalaenopsis spp. ), are indoors-only except in USDA zones 10 through 12. Indoors or outside, orchids often attract hungry white bugs. The only orchid parts safe from boisduval scale insects are the stems and flowers. All stages, from newly hatched nymphs to egg-laying adults, attach to and drain sap from orchids' leaves, leaf stems, pseudobulbs and roots. In the process, they inject the plant tissue with cell-destroying, tissue-yellowing toxins. Without early treatment, an infestation may kill its host orchid. Boisduval scales often hide beneath an orchid's old leaves. They also shelter under the papery covering of pseudobulbs -- podlike structures beneath the leaves at the base of many orchid varieties. The adult males feed in groups resembling bits of cotton wool. Waxy, white protective coverings conceal the egg-laying females. 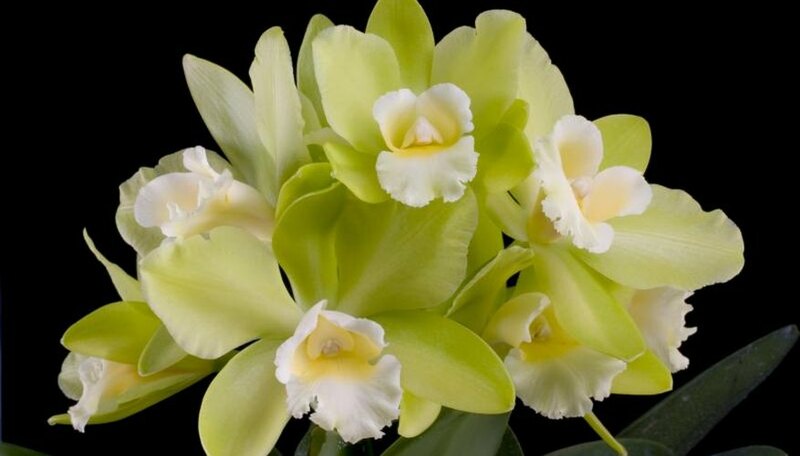 Immediately isolate infested orchids, if possible, and wipe the insects off with cotton balls dipped in 70-percent rubbing alcohol. Don't forget the rhizomes and roots. When they're dry, clean them again to remove dead females harboring eggs under their shells. Repeat every two to three weeks until the infestation is under control. It's easy to mistake mealybugs for male boisduval scales. Covered in fluffy, white wax, flat mealybugs also weaken orchids by stealing sap. The major differences between the pests are that mealybugs feed on flowers as well as the green tissues rhizomes and roots and drench their hosts in gooey, transparent waste, or honeydew. Eliminate small mealybug infestations with isopropyl alcohol, as you would the scale. When mealybugs infest the growing medium of potted orchids to feed on the roots, repotting is the only remedy. Gently rinse the roots to remove the medium and spray them with insecticidal soap before repotting. Discard the old medium in the garbage; it may contain eggs or larvae. Treat indoor and outdoor mealybugs with organic, ready-to-use insecticidal soap. When the temperature is below 90 degrees Fahrenheit and no sun is hitting the plants, spray until all their surfaces drip. Drench the leaf backs and leaf axils, where the leaves and stems join. Repeat every five to seven days, or as often as the soap label recommends. Follow the soap label's application instructions and dress in protective clothing and eyewear, waterproof gloves and a respiratory mask when spraying. Four-winged mini-moths covered in fine white wax, whiteflies congregate on the backs of orchid leaves and swarm from the plants in clouds when disturbed. Like scale and mealybugs, they weaken the plants by draining sap from the buds, flowers and tender new growth. They also excrete honeydew and may kill their hosts if not controlled. For quick removal of a small whitefly population, wash outdoor orchids down with a fine spray of hose water. Move indoor plants to the shower or sink for the same treatment. Collecting the pests with a battery-operated vacuum for disposal in sealed plastic bags also works, if done early in the morning when they're lethargic. Ready-to-use insecticidal soap also controls whiteflies when applied in the same way. To stop trouble before it starts, inspect and -- if necessary -- treat every new orchid for bugs before introducing it to older ones. Removing old leaves and spent flower sheaths deprives mealybugs and boisduval scale of their favorite hiding places. Whiteflies like dust. Rinsing the orchids and nearby plants and hosing down garden walkways regularly may discourage them. How Do I Care for My Orchid After the Blooms Die? What Is Eating My Indoor Plants?